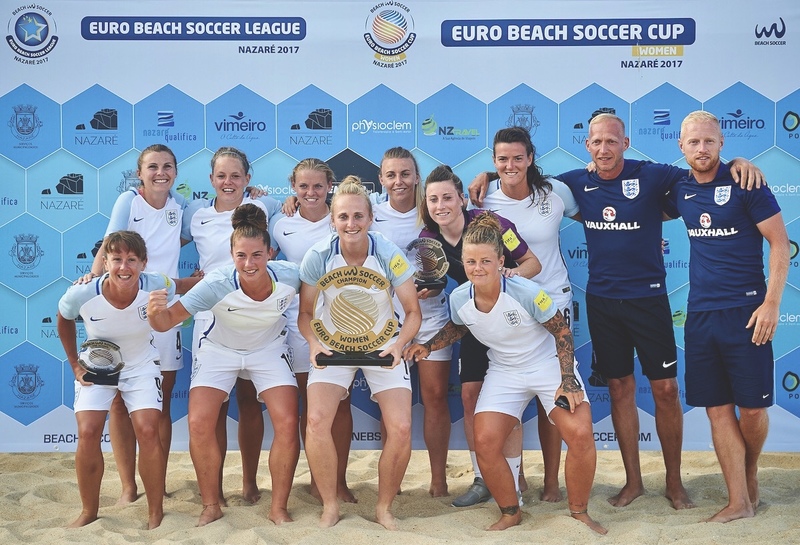 People have been kicking a ball around on beaches for many years now, but it was only as recently as 1992 that Beach Soccer Worldwide was set up and the game was formalised with rules and tournaments. There aren’t too many sandy beaches in the United Kingdom, which is why it had initially been difficult to establish ourselves in the sport. 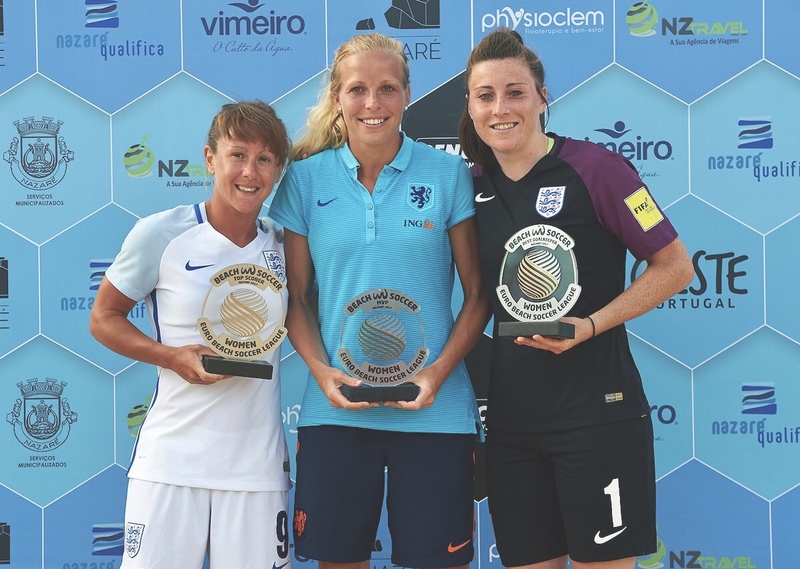 Nowadays the England Women’s side is one of the most competitive and most feared sides around and I was fortunate enough to speak with one of the team’s most established players, Gemma Hillier. Since 71: Can you tell me a little bit about you and your football background? Gemma: I have played for Portsmouth FC Women (on grass) for seventeen years, ten years as captain. I was recently inducted into the Portsmouth FC men’s hall of fame, for my contribution and commitment to the club, the first female ever to be inducted into a men’s club! It was a very proud accolade for myself and my family, and is great for female football in Portsmouth, to be recognised. How you were introduced to beach soccer? 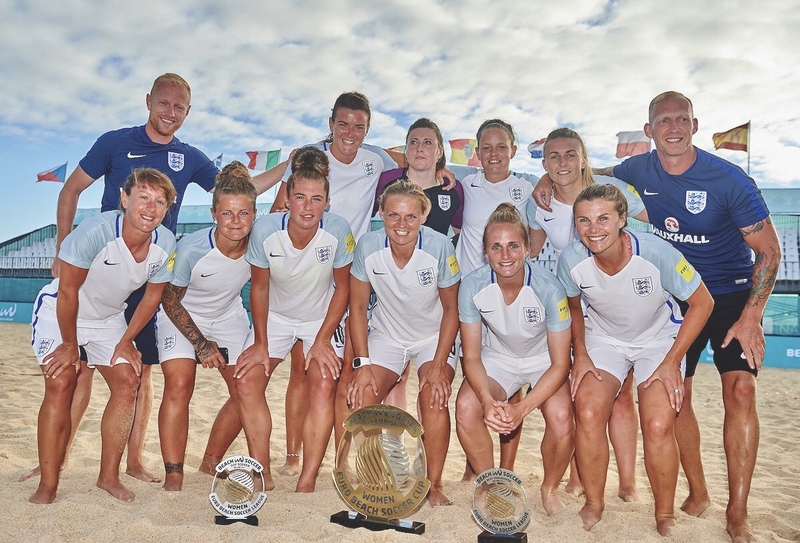 Our manager at Portsmouth five years ago was Perry Northeast who played beach soccer for the England men’s team, at the time we had a really good group of technical players at Portsmouth at the time, so Perry started up a ladies England beach soccer team, he asked me to play, which was where it all started. What would you say is the biggest challenge with playing on sand rather than grass? Definitely, the higher level of fitness required. Running on sand is so much harder, so to still be technically good when tired is very difficult. Does it take you long to adapt to playing on sand? I have always had very good fitness levels playing on grass, but maybe my technical game wasn’t as good as others, so I have had to spend a lot of time individually on the sand to improve that side of my game. I think it was great with the team starting together so everyone could improve together. I think beach soccer is an incredible sport, which I really enjoy, but it is not for everyone. We have had players that play grass football at a very high-level train with us and have really struggled to pick it up, it takes a lot of resilience! When playing on grass there is generally an emphasis on keeping the ball on the ground is that different in Beach Soccer? In beach soccer it is easier to play the ball in the air, otherwise it gets stuck in the sand. The women’s game is developing and teams/countries are now starting to have more plays in the air, but it is still a distance behind the men’s game, which is incredible to watch countries like Portugal and Brazil. The women’s game there are now good numbers of players who can bicycle kick and score spectacular volleys. When returning to grass after sand is hard not to be playing the ball in the air and trying overheard kicks? Playing beach soccer has made me a better grass player in the five years I have been playing, as the technical side of beach soccer is so important. It’s easy to go back and play grass football, as playing beach soccer gives you the confidence to control the ball in the air easier, and try things maybe players who only play grass football wouldn’t try, like a bicycle kick. I’ve heard that players will manipulate the sand for free kicks by flattening it out or building a little rugbyesque kicking tee. How do you approach free kicks? In beach soccer, the player who gets fouled has to take the free kick, so it’s different to grass football. The technique most players across the world use is the raised sand. You’re not allowed to use your hand so you have to use your feet to gather sand into a mound, then use the ball to shape the sand like a peaked mountain. For every free kick, you get a free shot on goal, so only the goalkeeper to beat, there are no ‘walls’, all players have to move out of the line of the goal. With no footwear worn during beach soccer do your feet take a bit of a battering? 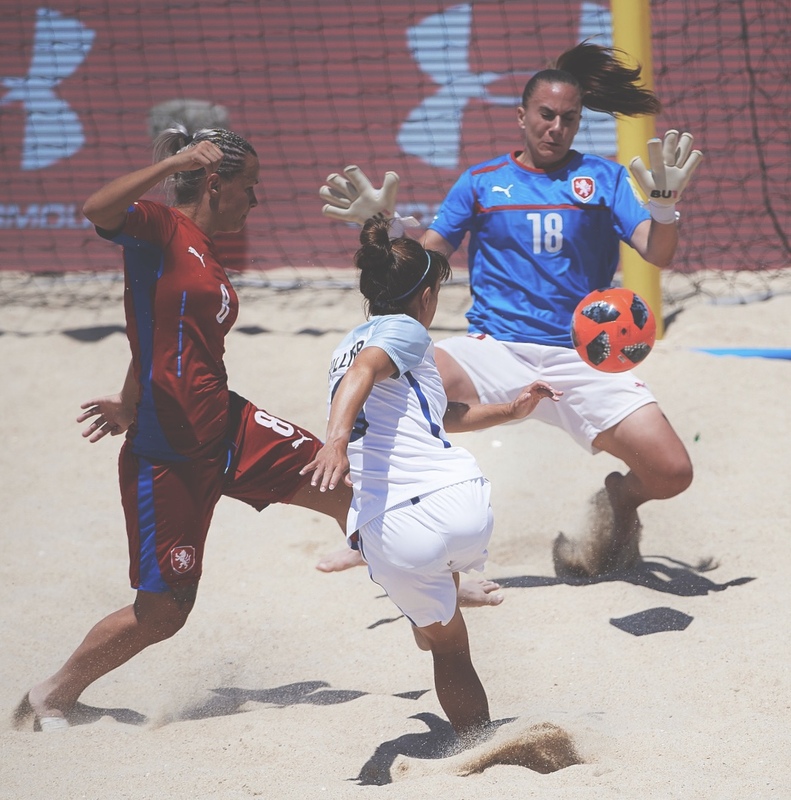 At the start of each beach soccer season, it takes a few sessions to get your feet used to playing again, but the ball is slightly more cushioned than a normal football so it doesn’t raid long. You’ve both been away this summer playing all over Europe. How has it been for you? The opportunities I have managed to get since starting beach soccer have been incredible, I am very lucky. At the start of the year I played for an American team, Shoreline Beach Soccer from San Diego in a tournament in Trinidad and Tobago. We won the tournament, and I got the top goal scorer and MVP award. We then had the Euro Winners Cup, which is like the Champions League of beach soccer, but played over a week. This is the top teams from each country in Europe, we represent Portsmouth. For the second year in a row we lost in the final, which was gutting. The women’s game has developed so much since last year, it’s still a great achievement to reach the final. Next was the European Cup, where we, England were reigning champions. We didn’t play as well as we know we can, and had a number of new players, playing in their first tournaments, we came forth. I have been going out to play in Switzerland over a number of weekends in July and August for a team called ‘Chargers’ where we have qualified for the finals at the end of August. Finally, I was asked to play for a team in Spain, San Javier who have been Spanish champions for the past two years. I have just got back from being there for ten days. Although we cake third, this was one of my favourite experiences, as the team and coaching staff made me feel part of their family. Representing my country has to be the biggest high, although we didn’t get the results we wanted, getting to wear the shirt and sing the national anthem is always special. 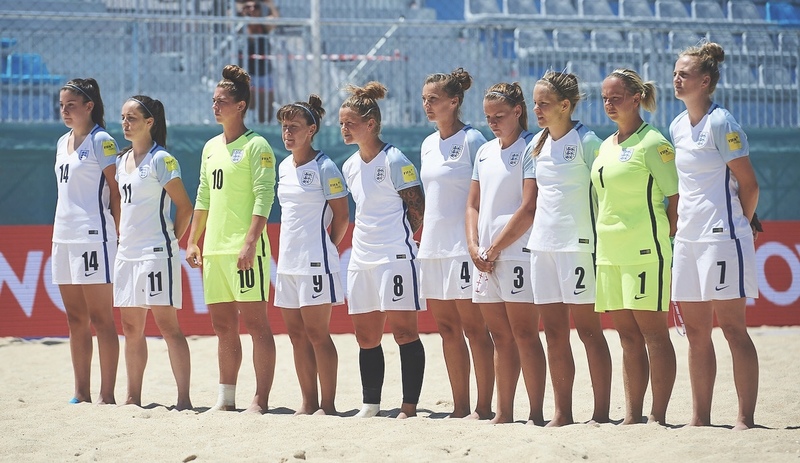 How would our readers go about getting involved in Beach Soccer? 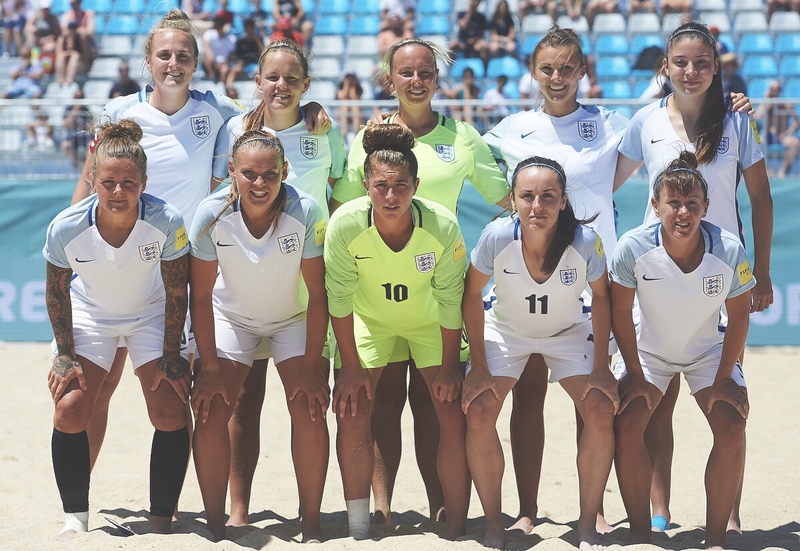 Sadly in England there are not many opportunities to get involved in beach soccer, but we have a national training centre in London now, where we have a permanent man-made pitch. We are always looking for players to get involved so we have a bigger pool of players to pick from for the national team, to hopefully take us back to the heights we reached last year. Perry Northeast the manager would love to hear from anyone that wants to get involved! Are you looking forward to getting back onto grass for this upcoming season? Where will you be plying your trade and what are your aims for the season? I have had a very busy, hard summer of beach soccer, so I am unsure of my plans for grass football this season. There are lots more beach soccer opportunities and tournaments across the world being organised so I probably won’t play grass football this season.